Whether you’re a business who relies on your freezers to keep your food safe, or a homeowner who just wants to ensure that nothing goes to waste, your freezer is important – and when it needs to be fixed, it needs to be fixed fast. Toronto Refrigeration offers extensive freezer repair services to help ensure your freezer stays just as frosty as you’d like it to be, no matter what. Your freezer is one of those parts of your home that you don’t often think about until something goes wrong. A malfunctioning freezer can be the cause of headaches, lost food, lost money and even potential damage to your home. The key to avoiding any long-term damage is getting your freezer repair done quickly and properly by technicians like ours who know exactly what they’re doing. At Toronto Refrigeration, our qualified freezer repair technicians can handle any kind of repair job, big or small, major or minor, as well as performing scheduled and emergency maintenance work to keep your appliance running. No matter what the brand of your freezer is or where you bought it, our experts are uniquely qualified to troubleshoot and repair a wide range of name-brand models, including LG, Whirlpool and Maytag. 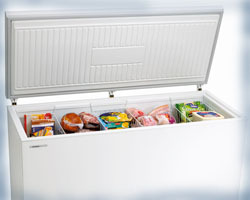 We also stock a selection of freezer and refrigerator parts for all the brands we service, meaning you’ll never have to worry about experiencing a delay in your repair because of a missing part. From routine freezer issues like broken thermostats and leaking coolant to more complicated problems and repairs, we can help with any kind of problem – not to mention the fact that we offer some of the most affordable and consistent pricing in the Toronto freezer repair industry. Plus, every repair we make is backed by our Service Satisfaction Guarantee! From Freon leaks to leaky water valves and beyond, we cover it all and make your experience a stress-free and seamless one. At Toronto Appliance Repair, we know how difficult it is to continue on a daily basis without a working and properly functioning freezer, and this is exactly why we have focused our training and expertise on delivering thorough diagnostic techniques and resolution. The temperature in my freezer is too warm. My freezer will not run. My freezer is making strange noises. There is frost build-up in my freezer. There is small amount of water leaking on the floor next to my freezer. My freezer is continuously running. Call TorontoRefrigeration Appliance Repair Service Now For High Quality Toronto Appliance Repair Toronto Freezer Repair Toronto That Is Affordable And Effective.